A whooping £215,625,000 was spent during this transfer window with some of the great names of football taking some crucial steps of their respective career. Some for money, some for fame. At the end of it, only time will tell as to whether it was worth it or not! The huge signing of this transfer window. Torres to Chelsea from Liverpool for a £50million dead-line day swoop which shattered the record for a transfer between two British clubs – as Newcastle’s Andy Carroll moved to Anfield to fill his boots. The funny part here being Carroll cost Liverpool £5 million more than what David Villa cost for Barca 😛 . Is Caroll worth more than the Barca forward Villa?? This is where Newcastle benefited out of the Torres saga. Under any circumstance, Torres was bound to join Chelsea and Kenny Daglishe’s side who are 13th in the table, struggling in all possible ways wanted a replacement for Torres. Caroll was the man! Caroll joins Luiz Suarez who has made a move from Ajax for what is believed to be £22.8 million. Kenny has taken a huge risk by investing all the amount of the Torres transfer into Caroll and Suarez. I bet you, this is beginning of the reds emergence. Paul Konchesky of Liverpool moving out on loan to Nottingham Forest was a real shocker. Another name which was floating around for quite a long time in the transfer market was that of David Luiz of Benefica, a target for Chelsea FC. This move too was completed on the deadline day for a sum of nearly £26.5 million. Chelsea the title holders, are struggling to keep pace with Machester United. Injuries being the main concern for Carlo Ancelotti. This signing will surely prove worthy for the Londoners, who have had problems with their defense off late. It is believed that, Ramires, Chelsea summer signing for Benefica played a crucial role to convince his ex-teammate David Luiz to join the club.Daniel Sturridge moved to Bolton, and Kakuta to Fulham on loan until the end of the season. Overall a very huge hand played by Roman Abramhovich by bolstering the squad which now have surely high expectations. Carlo must get back to winning ways. If not, end of the road for him. Manchester United and Arsenal as expected were silent through out the January Transfer window with just a one player bought by each of the clubs and many more leaving out on loan till the end of the season. Santa Cruze was reunited with his Blackburn team mates after a disastrous spell at Eastlands. The class of Santa Cruze was really wasted on the bench. Manchester city’s unhappy striker Emanuel Adebayor made his exit from Eastlands to the giants in Spain Real Madrid on a season long loan move. The shocker for me however was Shay Given staying at Eastlands even after warming the bench for the complete first half of the season! Stoke City roped in Aston Villa’s Carew whose just tremendous through air and since the arrival of Darren Bent from sunderland for a huge fee of £24m, he was sure to loose his starting place. Good move according to me and roping in Bent was a tremendous move by Gerrard Houliier which brought instant result when Villa won against City where Bent scored the lone goal. Must wait and watch how well Carlos Vela adjusts himself to life at WBA. In Ryo Miyaichi (unattached, undisc). Out Wellington (Levante, loan), Aaron Ramsey (Cardiff, loan), Vito Mannone (Hull, loan), Carlos Vela (West Bromwich, loan), Craig Eastmond (Millwall, loan), Henri Lansbury (Norwich, loan), Benik Afobe (Huddersfield, loan), Cedric Evina (Oldham, free), Kyle Bartley (Rangers, loan), Ryo Miyaichi (Feyenoord, loan). In Kyle Walker (Spurs, loan), Jean Makoun (Lyon, £6m), Darren Bent (Sunderland, £18m-£24m), Michael Bradley (B Mönchengladbach, loan). Out Stephen Ireland (Newcastle, loan), Brad Guzan (Hull, loan), Steve Sidwell (Fulham, undisc), John Carew (Stoke, loan), Jonathan Hogg (Portsmouth, loan), James Collins (Shrewsbury, loan), Shane Lowry (Sheffield Utd, loan), Isaiah Osbourne (to Sheffield Wednesday, loan), Andreas Weimann (Watford, loan), Curtis Davies (B’ham, £1.75m). In David Bentley (Tottenham, loan), Curtis Davies (Aston Villa, £1.75m), Obafemi Martins (Rubin Kazan, loan). Out Míchel (AEK Athens, loan), Marcus Bent (Sheff Utd, loan), Jay O’Shea (Port Vale, loan), Jake Jervis (Hereford, loan), Nathan Redman (Burton, loan), Daniel Preston (Hereford, loan). In Rubén Rochina (Barcelona, undisc), Jermaine Jones (Schalke, loan), Roque Santa Cruz (Manchester City, loan), Mauro Formica (Newell’s Old Boys, undisc). Out Pascal Chimbonda (released), Aaron Doran (Inverness, loan), Alex Marrow (Crystal Palace, undisc), Alan Judge (Notts County, undisc), Nick Blackman (Aberdeen, loan), El Hadji Diouf (Rangers, loan). In Andy Reid (Sunderland, undisc), James Beattie (Rangers, loan), Salaheddine Sbai (Nîmes, undisc), Jason Puncheon (Southampton, loan), Sergei Kornilenko (Zenit St Petersburg, loan). Out Dekel Keinan (Cardiff, undisc), Louis Almond (Barrow, loan), Ashley Eastham (Cheltenham, loan), Ishmel Demontagnac (Stockport, loan), Stephen Husband (Stockport, loan), Mark Halstead (Kettering, loan). In David Wheater (Middlesbrough, undisc), Daniel Sturridge (Chelsea, loan). Out Andy O’Brien (Leeds, undisc). In Fernando Torres (Liverpool, £50m), David Luiz (Benfica, £26.5m) . Out Daniel Sturridge (Bolton, loan), Ben Gordon (Scunthorpe, loan), Danny Philliskirk (Sheffield Utd, loan), Gaël Kakuta (Fulham, loan), Patrick van Aanholt (Leicester, loan), Nemanja Matic (Benfica, part-exchange). In Eric Dier (Sporting Lisbon, loan), Apostolos Vellios (Iraklis Thessaloniki, nominal). Out Steven Pienaar (Spurs, £3m), Kieran Agard (Peterborough, loan), Yakubu Ayegbeni (Leicester, loan), Zac Thompson (Leeds, free), James Vaughan (Crystal Palace, loan). In Steve Sidwell (Aston Villa, undisc), Gaël Kakuta (Chelsea, loan), Eidur Gudjohnsen (Stoke, loan). In Andy Carroll (Newcastle, £35m), Luis Suárez (Ajax, £22.8m), Conor Thomas (Coventry, loan). 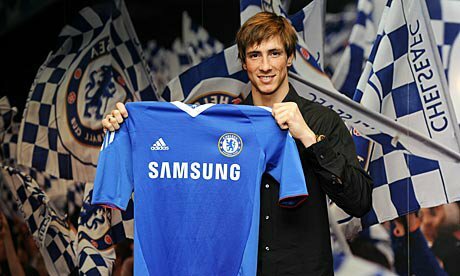 Out Fernando Torres (Chelsea, £50m), Nathan Eccleston (Charlton, loan), Ryan Babel (Hoffenheim, £6m), Victor Palsson (Hibernian, undisc), Stephen Darby (Notts County, loan), David Amoo (MK Dons, loan), Paul Konchesky (Nottm Forest, loan). In Edin Dzeko (Wolfsburg, £27m). Out Wayne Bridge (West Ham, loan), Roque Santa Cruz (Blackburn, loan), Emmanuel Adebayor (R Madrid, loan), Ben Mee (Leicester, loan), Abdisalam Ibrahim (Scunthorpe, loan), Javan Vidal (Ch’field, loan). In Anders Lindegaard (Aalesund FK, £3.5m). Out Corry Evans (Hull, loan), Federico Macheda (Sampdoria, loan), James Chester (Hull, £300,000), Ritchie De Laet (Portsmouth, loan), Ben Amos (Oldham, loan), Joe Dudgeon (Carlisle, loan), Danny Drinkwater (Watford, loan). In Stephen Ireland (Aston Villa, loan), Hatem Ben Arfa (Marseille, undisclosed). Out Andy Carroll (Liverpool, £35m), Wayne Routledge (QPR, loan), Matthew Grieve (Stockport, loan), Tama Kadar (H’field, loan), Ryan Donaldson (H’pool, loan), Xisco (Deportivo La Coruña, loan). In Jermaine Pennant (Real Zaragoza, £1.725m-£2.8m), John Carew (Aston Villa, loan). Out Eidur Gudjohnsen (Fulham, loan), Tuncay Sanli (Wolfsburg, £4.5m), Liam Lawrence (Ports’mouth, undisc). In Sulley Muntari (Inter, loan), Stéphane Sessègnon (from Paris St Germain, £6m). Out Andy Reid (Blackpool, undisc), Darren Bent (Villa, £18m-£24m), Liam Noble (Carlisle, loan), George McCartney (Leeds, loan), Matt Kilgallon (to Doncaster, loan), David Healy (to Rangers, loan), Michael Kay (Tranmere, loan), Paulo da Silva (Real Zaragoza, undisc), Trevor Carson (Lincoln, loan). In Bongani Khumalo (Supersport Utd, £1.5m), Steven Pienaar (Everton, £3m). Out Kyle Walker (Villa, loan), David Bentley (B’ham, loan), Jamie O’Hara (Wolves, loan), Robbie Keane (West Ham, loan), Harry Kane (L Orient, loan), Jonathan Obika (Peterborough, loan), Ryan Mason (Doncaster, loan), Tommy Carroll (L Orient, loan), Gio dos Santos (Racing Santander, loan). In Carlos Vela (Arsenal, loan). Out Ishmael Miller (QPR, loan), Luke Daniels (Bristol Rovers, loan), Joe Mattock (Sheff Utd, loan), Kayleden Brown (Port Vale, loan), Romaine Sawyers (Port Vale, loan), Reuben Reid (Oldham, free). In Wayne Bridge (Man City, loan), Demba Ba (Hoffenheim, undisc), Robbie Keane (Spurs, loan), Gary O’Neil (Boro, undisc). Out Valon Behrami (Fiorentina, undisc), Frank Nouble (Barnsley, loan). In Conor Sammon (Kilmarnock, undisc). Out Mauro Boselli (Genoa, loan), Lee Nicholls (Shrewsbury, loan). In Adam Hammill (Barnsley, undisc), Leigh Griffiths (Dundee (£150,000), Jamie O’Hara (Spurs, loan), Adriano Basso (unattached). Out Greg Halford (Portsmouth, loan), Matt Hill (to Barnsley, on loan), Andy Keogh (Bristol City, loan). The season is just half done! A lot of action still remains. I am sure the climax will surely be worth watching. Originally posted at January Football Transfers – My Take!